Mice infected with attenuated strains of mouse hepatitis virus, strain JHM, develop a chronic infection in the brain and spinal cord characterized by low levels of viral Ag persistence and retention of virus-specific CD4 and CD8 T cells at the site of infection. It is not known whether these cells are maintained by proliferation of T cells that entered the CNS during acute infection or are newly recruited from Ag-experienced or naive T cell pools. In this study, using adoptive transfer experiments and bone marrow chimeras, we show that at least some of these cells are recruited from the periphery, predominantly from the viral Ag-experienced T cell pool. Both virus-specific CD4 and CD8 T cells are functional, as assessed by cytokine expression and degranulation after peptide exposure. In addition, populations of virus-specific CD4 T cells undergo dynamic changes in the infected CNS, as previously shown for CD8 T cells, because ratios of cells responding to two CD4 T cell epitopes change by a factor of five during the course of persistence. Collectively, these results show that maintenance of T cell responses in the virus-infected CNS is a dynamic process. Further, virus-specific T cell numbers at this site of infection are maintained by recruitment from peripheral Ag-experienced and naive T cell pools. The CNS is a favored site for persistence of viruses and other pathogens because T cell surveillance is less effective than in other organs. Neurotropic strains of mouse hepatitis virus, such as JHMV, cause localized infections in the CNS with clinical and pathological manifestations of acute and chronic demyelinating encephalomyelitis. One commonly studied variant, J2.2-V-1, selected using a neutralizing Ab directed against the surface glycoprotein (1), causes an acute, mild encephalitis and a subacute encephalomyelitis, with predominant infection of glia, especially oligodendrocytes. J2.2-V-1 RNA but not infectious virus can be detected in the CNS for up to 2 years post infection (p.i. )3 (2). Antivirus CD8 T cells can be detected throughout the course of persistence (3), but the origin of these cells remains uncertain. The presence of viral products is required for T cell persistence in the CNS, because virus-specific CD8 T cells are not detected when mice are infected with a strain of JHMV that is completely cleared from the CNS (4). These studies focused on the antivirus CD8 T cell response. Antivirus CD4 T cells in the CNS have been shown to have both protective and pathogenic effects in JHMV-infected mice (5, 6), but the kinetics of the virus-specific CD4 T cell response and the role of these cells in pathogenesis at later times p.i. are not known. It has been postulated that J2.2-V-1-specific T cells in the chronically infected CNS are derived from cells recruited into the CNS during the acute stage and are maintained by mechanisms that are IL-15 independent (3). Further, entry of T cells into CNS generally requires blood-brain barrier breakdown and is facilitated by inflammation. Because inflammation is largely resolved in the J2.2-V-1-infected CNS after the acute infection subsides, one implication is that the blood brain barrier is intact at late times p.i., thereby minimizing the likelihood that inflammatory cells would enter this site of infection. Although these observations could be consistent with the survival or proliferation of T cells that entered the CNS during times of maximal inflammation, they do not eliminate the possibility that T cell replenishment in the chronically infected CNS is dynamic and requires continued ingress of virus-specific T cells from the periphery. Although little is known about T cell maintenance at sites of localized chronic infection, including the CNS, recent work has shown that in the context of persistent systemic viral infections, maintenance of virus-specific T cells is Ag-dependent (7, 8). This is in marked contrast to memory cells that are analyzed after acute infections, which undergo Ag-independent homeostatic proliferation in response to IL-15 and IL-7 (9). In mice that are chronically infected with lymphocytic choriomeningitis virus (LCMV), or polyoma virus, virus-specific T cell pools are replenished by recruitment from naive cell populations as well as viral Ag-driven cell division (8, 10, 11). These results raise the possibility that virus-specific T cells will also be recruited from the naive T cell pool to sites of localized infection. In this study, we use mice persistently infected with a recombinant version of J2.2-V-1 (rJ2.2) to show that while virus-specific T cells in the CNS show evidence of low levels of proliferation, these cells are also replenished by recruitment from peripheral Ag-experienced and naive T cell pools. We also show that virus-specific CD4 T cells, like virus-specific CD8 T cells, persist in the chronically infected CNS and further, that the pattern of immunodominance of the CD4 T cell response changes during persistence. Specific pathogen-free 6-wk-old C57BL/6 mice (B6, Thy1.2) were purchased from the National Cancer Institute, Bethesda, MD. Thy1.1 B6 mice were obtained from The Jackson Laboratory. All animal studies were approved by the University of Iowa Animal Care and Use Committee. Recombinant J2.2-V-1 (rJ2.2) was developed as previously described (12, 13) and propagated on 17Cl-1 cells. Virus was titered on HeLa cells expressing the mouse hepatitis virus receptor (CEACAM1) (14, 15) as previously described (16). Mice were inoculated intracerebrally with 600 PFU of rJ2.2 in 30 μl of DMEM and were examined and weighed daily. Clinical evaluation was based on the following scoring system: 0, asymptomatic; 1, limp tail; 2, wobbly gait with righting difficulty; 3, hind-limb weakness; 4, hind-limb paralysis; 5, moribund. Spinal cords were fixed with 10% zinc-formalin and embedded in paraffin. Sections were prepared and reacted sequentially with mouse mAb directed against the nucleocapsid (N) protein of rJ2.2 (clone 5B188.22, a gift from M. Buchmeier, (University of California, Irvine, CA)), biotinylated goat anti-mouse Ab (Jackson ImmunoResearch Laboratories), avidin HRP (Jackson ImmunoResearch Laboratories), and 3,3′-diaminobenzidine (Sigma-Aldrich), and finally counterstained with hematoxylin. As controls, sections processed in the absence of primary Ab and those from uninfected mice were analyzed. In both cases, no staining was detected. In most instances, mononuclear cells were isolated from brains and spinal cords as described previously (17). In brief, tissues were mechanically homogenized using frosted glass slides. Cells were suspended in 30% Percoll (Pharmacia Biotech) and centrifuged at 300 × g at 4°C for 30 min. Percoll and lipid layers were aspirated and the cell pellet was resuspended and counted. The number of lymphocytes harvested from each infected brain ranged from 1 to 2 × 106. For samples harvested later than 70 days p.i., tissues were dispersed using 25G needles, homogenized by pipetting and digested with collagenase D (1 mg/ml, Roche Diagnostics) and DNase I (0.1 mg/ml, Roche Diagnostics) at 37°C for 30 min. Mononuclear cells were isolated by passing the tissue through a 70-μm cell strainer, followed by Percoll gradient (70%/37%) centrifugation. Mononuclear cells were removed from the interphase, washed, and resuspended in culture medium for further analysis. The following Abs were used in this study: CD4 (GK1.5 or RM 4-5), CD8α (53-6.7), CD16/CD32 (2.4G2), CD90.1 (OX-7), CD127 (A7R34), IL-2 (JES6-5H4), TNF-α (MP6-XT22), IFN-γ (XMG1.2), and Bcl-2 (3F11), all from BD Pharmingen; granzyme B (16G6) and CD16/CD32 (93), both from eBioscience; CD107a (1D4B) and CD107b (M3/84), both from BioLegend. For detection of intracellular cytokine expression, CD8 T cells were stimulated with 1 μM peptide S510 and CD4 T cells were stimulated with 5 μM peptides M133 or S358 in the presence of 1 μl/ml Golgiplug (BD Pharmingen) and CHB3 cells (H-2Db, I-Ab) as APCs. These epitopes encompass residues 133–147 of the transmembrane (M) protein and residues 358–372 and 510–518 of the S glycoprotein (18, 19, 20). Intracellular expression of IFN-γ, TNF, IL-2, granzyme B, and Bcl-2 was detected. In some experiments, M133-specific and S510-specific cells were detected using PE-conjugated I-Ab/M133 and H-2Db/S510 tetramers, respectively, obtained from the National Institutes of Health Tetramer Facility (National Institute of Allergy and Infectious Disease MHC Tetramer Core Facility). Cells were stained with 8 μg/ml I-Ab/M133 tetramers for 1 h at 37°C, or 5 μg/ml H-2Db/S510 tetramers for 30 min at 4°C. Cells were then incubated with anti-CD16/CD32-biotin and anti-CD4-FITC or anti-CD8-FITC mAb, followed by avidin-APC or avidin-PerCP. Cells were analyzed using a FACSCalibur (BD Biosciences). Results are shown after gating on CD16/CD32 negative cell populations. All mice were given one i.p. injection of 2 mg of BrdU solution (BD Pharmingen). For acutely infected mice, BrdU incorporation was examined 16 h after injection. For chronically infected mice, a BrdU (Sigma-Aldrich) solution of 0.8 mg/ml sterile water was prepared fresh daily and supplied as drinking water for 7 consecutive days, beginning 1 day after the i.p. injection. Intracellular detection of BrdU and cytokines in peptide-stimulated T cells was performed using reagents and protocols provided by the manufacturer (APC BrdU flow kit, BD Pharmingen). Cells harvested from infection-matched, BrdU nontreated mice served as controls for the FACS analyses. For adoptive transfer of Ag-experienced T cells, spleen CD8+ T cells were enriched from acutely (day 6 p.i.) or chronically (day 49 p.i.) infected Thy1.1 mice by negative selection (Miltenyi Biotec). Two × 107 cells were transferred i.v. into infection-matched (infected on the same day) Thy1.2 recipients. CNS, spleen, and CLN (cervical lymph nodes) of recipients were examined for the presence of S510 tetramer+ donor-derived CD8 T cells. To measure recruitment of naive T cells, we adapted a protocol described elsewhere (21). Persistently infected B6/Thy1.2 mice (> 32 days p.i.) were treated with 600 μg busulfan i.p. (Busulfex; Otsuka America Pharmaceutical, a gift from Dr. Aron Lukacher, Emory University, Atlanta, GA). Twenty-four hours later, these mice were injected i.v. with 2 × 107 nucleated cells isolated from bone marrow of naive congenic Thy1.1 mice. Blood, spleen, CLNs, and CNS of chimeric mice were analyzed by flow cytometry >40 days after bone marrow transplantation. One-tailed unpaired Student’s t tests were used to analyze differences in mean values between groups. All data are presented as means ± SEM. Differences with values of p < 0.05 were considered significant. Although previous reports have shown that J2.2-V-1 RNA can be detected in the CNS for as long as 2 years p.i (2), viral Ag has not been detected in the persistently infected CNS. T cell persistence in the J2.2-V-1-infected CNS correlates with viral RNA levels (4), so it is likely that viral Ag is also present. We developed a recombinant version of J2.2-V-1 (rJ2.2) (12, 13) and used this virus in our studies to minimize genetic variability in the initial inoculum. Like nonrecombinant J2.2-V-1 (22, 23), this virus caused a mild encephalitis, characterized by weight loss during the acute phase of the infection (Fig. 1⇓A) and a 20% mortality (Fig. 1⇓B). Both viruses are cleared by days 9–12 p.i. (Ref. 23 and our unpublished observations). Mice that survived the acute infection developed signs of hindlimb weakness as the acute phase resolved. We determined clinical scores as described in Materials and Methods, excluding mice that did not survive the acute infection. As expected, clinical disease largely resolved by day 42 p.i. (Fig. 1⇓C). However, virus Ag could be detected as late as day 85 p.i. using immunohistochemical analysis (Fig. 1⇓D), although the number of Ag-positive cells was greatly diminished from the peak of the infection (data not shown). Little evidence of inflammation was detected at sites of Ag deposition. rJ2.2 causes a persistent infection in the CNS. Mice were infected with rJ2.2 intracerebrally and monitored for weight loss (A), mortality (B), and clinical illness (C) (n = 130 mice). D, Spinal cords from mice 85 days p.i. were fixed and embedded in paraffin. Sagittal sections were prepared and stained for virus Ag (N protein) as described in Materials and Methods. Sections processed in the absence of primary Ab were used as controls. Total numbers of infiltrating mononuclear cells diminished ∼2-fold in the brain and 3- to 4-fold in the spinal cord between days 14 and 70 p.i. (Fig. 2⇓A), although numbers of total CD8 and CD4 T cells decreased more rapidly (Fig. 2⇓, B and E). At least two CD8 T cell epitopes (S510 and S598) and three CD4 T cell epitopes (M133, S333, S358) are recognized in J2.2-V-1-infected B6 mice (19) with epitopes S510 and M133 eliciting the most abundant CD8 and CD4 T cell responses in mice acutely infected with J2.2-V-1. Initially, we used MHC class I and class II/peptide tetramers to detect epitope S510 and M133-specific T cells. In agreement with previous results (4), a CD8 T cell response to S510 was detected at all times p.i., with a gradual decrease in numbers (Fig. 2⇓D), but not frequency of responding cells in both the brain and spinal cord during persistence (Fig. 2⇓C). Also, a higher percentage of S510-specific CD8 T cells was detected in the spinal cord compared with the brain (Fig. 2⇓C). For analyses of epitope M133-specific T cells, we measured IFN-γ expression after peptide stimulation because this assay detected more epitope M133-specific cells than did staining with M133 tetramer. This was especially evident at late times p.i. (Fig. 3⇓). Using this assay, we found that the frequency of epitope M133-specific T cells in the brain decreased after day 21 and remained constant after day 28 p.i. ; the frequency of these cells diminished more slowly in the spinal cord (Fig. 2⇓F). The numbers of M133-specific T cells decreased from day 14 to 70 p.i. at both sites, reflecting decreases in total numbers of CD4 T cells (Fig. 2⇓G). Virus-specific CD8 and CD4 T cells are detected in the CNS of mice persistently infected with rJ2.2. Temporal changes in total mononuclear cell numbers (A), total CD8 and CD4 T cell numbers (B and E), percentage and numbers of S510-specific CD8 (determined by tetramer staining) (C and D), and M133-specific CD4 T cells (determined by IFN-γ production; numbers are calculated after subtraction of no peptide controls) (F and G) in the brain and spinal cord over 70 days of infection are shown (n = 5–17 mice per time point). 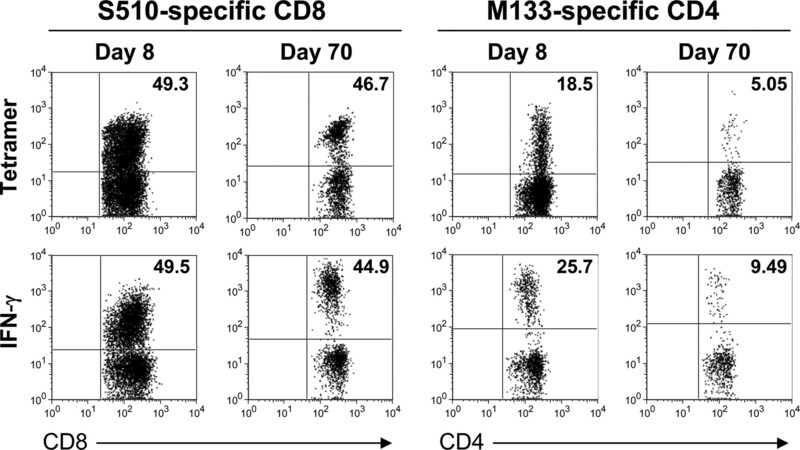 Greater numbers of M133-specific CD4 but not S510-specific CD8 T cells are detected by intracellular IFN-γ expression compared with staining with tetramer. Frequencies of S510-specific CD8 and M133-specific CD4 T cells in the brain were determined by IFN-γ production in response to peptide stimulation and by tetramer binding at days 8 and 70 p.i. Data are representative of at least ten individual analyses at each time point. However, not all virus-specific CD4 T cells showed the same pattern of accumulation because cells responding to the subdominant S358 epitope increased in frequency after day 28, so that by day 70, nearly equal numbers of CD4 T cells in the brain responded to epitopes M133 and S358 (Fig. 4⇓A). The change in immundominance did not reflect preferential egress from the CNS or trafficking into the CNS because similar percentages of splenic CD4 T cells responded to each epitope (Fig. 4⇓B). Changes in the relative frequency of M133 and S358-specific CD4 T cells could reflect differences in survival. Bcl-2 is an anti-apoptotic molecule that is up-regulated in CD8 T cells that become memory cells (24). As shown in Fig. 4⇓, C and D, S358-specific CD4 T cells express Bcl-2 at higher levels than M133-specific cells at day 42, consistent with enhanced survival. Changes in ratio of epitope M133/S358-specific CD4 T cells in the CNS occur during persistence. 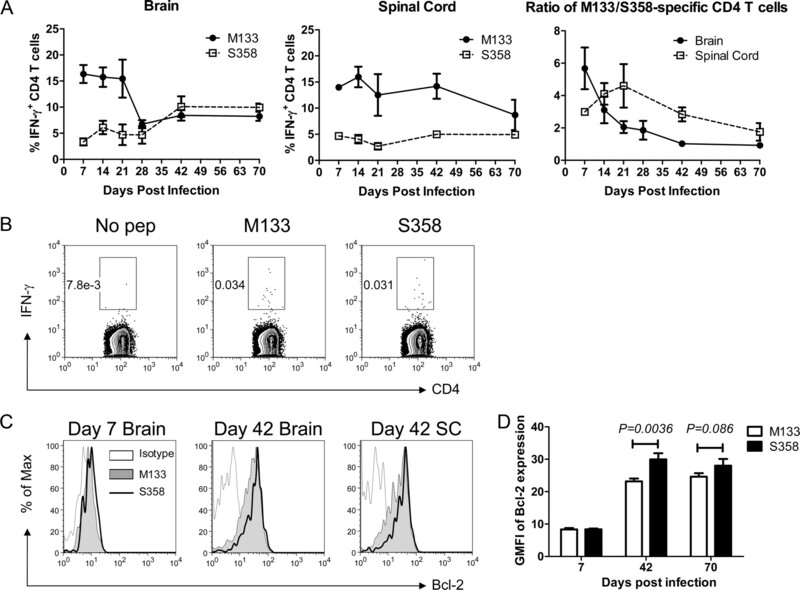 A, Percentage of epitope M133 and S358-specific CD4 T cells and the ratio of M133-specific to S358-specific CD4 T cells in the brain and spinal cord during 70 days of infection are shown (n = 5–16 mice per time point). B, Frequency of M133-specific and S358-specific CD4 T cells in the spleen at day 42 p.i. Data shown are representative of five mice. C, Bcl-2 expression by M133- and S358-specific CD4 T cells in the brain and spinal cord (SC) at days 7 and 42 p.i. Cells from three spinal cords were pooled together. D, Geometric mean fluorescence intensity (GMFI) of Bcl-2 expression by M133- and S358-specific CD4 T cells in the brain. Data at each time point are representative of three independent experiments. Three, seven, and seven mice were analyzed at days 7, 42, and 70, respectively. Previous studies indicated that CD8 T cells in the CNS of mice persistently infected with J2.2-V-1 are functionally impaired, as shown by reduced cytotoxic function when assessed directly ex vivo (25). We also observed that levels of granzyme B were diminished in virus-specific CD8 T cells harvested from chronically, as opposed to acutely, infected brains and spinal cords (Fig. 5⇓A), but also that degranulation was not compromised in these cells (Fig. 5⇓B). These results suggest that these cells are functional, but reduced in killing capacity on a per cell basis. 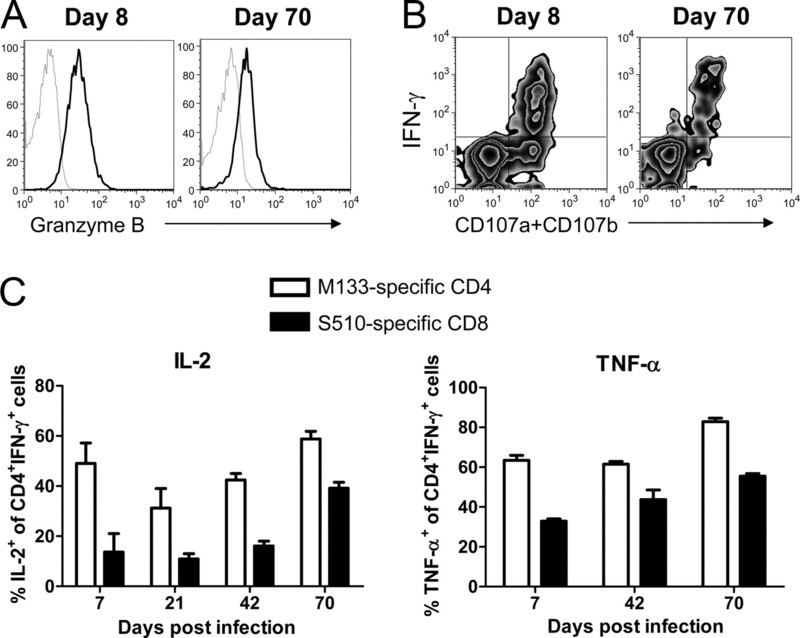 In terms of cytokine secretion, equivalent numbers of CD8 T cells in the persistently infected CNS produce IFN-γ in response to virus-specific peptides and bind S510 tetramer (Fig. 3⇑). Further, the fraction of IFN-γ-producing CD8 T cells that also expressed TNF-α or IL-2 was at least as high at day 70 as at earlier time points, suggesting that these cells are not impaired in cytokine production (Fig. 5⇓C). Similarly, the majority of CD4 T cells that expressed IFN-γ in response to peptide M133 at day 70 p.i. also expressed TNF-α or IL-2, and this fraction was higher than observed at earlier time points p.i. (Fig. 5⇓C). Virus-specific CD4 and CD8 T cells remain functional in the persistently infected brain. A, Brain mononuclear cells harvested at days 8 and 70 p.i were stimulated with S510 peptide directly ex vivo. IFN-γ producing S510-specific CD8 T cells were analyzed for granzyme B expression (dark lines). Lower levels of granzyme B were detected at day 70 than day 8, when compared with samples stained with control isotype Ab (light lines). Data shown are representative of five mice. B, Degranulation of brain-derived virus-specific CD8 T cells was determined by CD107a and b expression in response to S510 peptide directly ex vivo at days 8 and 70 p.i. FITC-conjugated anti-CD107a and CD107b Abs were added at the same time as peptide. Data shown are representative of four mice. C, Brain mononuclear cells harvested at different time p.i. were stimulated with S510 or M133 peptide. 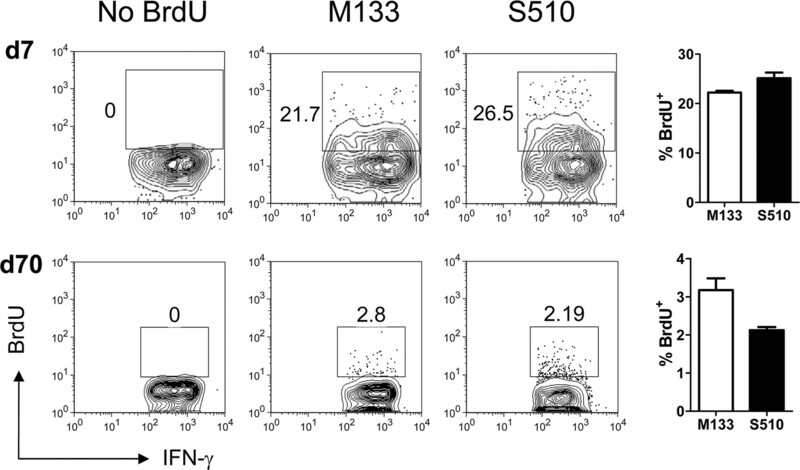 Percentages of IFN-γ-producing S510-specific CD8 and M133-specific CD4 T cells that coexpressed IL-2 or TNF-α are shown (n = 3–5 mice per time point). To determine whether virus-specific CD8 and CD4 T cells present in the persistently infected CNS enter the CNS during the acute phase and undergo proliferation in situ, or are replenished by recruitment from the periphery, we initially visualized T cell proliferation by examining BrdU incorporation during acute and chronic infection. Although ∼20–30% of virus-specific CD8 and CD4 T cells were BrdU+ at day 7 p.i. after a 16 h label, only 2–4% were BrdU+ at day 70 after 7 days of labeling, suggesting a low level of homeostatic or Ag-driven proliferation in the chronically infected CNS (Fig. 6⇓). However, these results do not indicate whether virus-specific T cells resident in the CNS proliferated in situ or whether cells proliferated in the periphery and migrated to the CNS. Virus-specific CD4 and CD8 T cells in the CNS exhibit low levels of proliferation during persistent infection. BrdU incorporation by M133-specific CD4 and S510-specific CD8 T cells in acutely (day 7 p.i.) and chronically (day 70 p.i.) infected CNS samples is shown (brains and spinal cords were combined). Infection-matched, BrdU nontreated mice served as controls. Cells are gated on IFN-γ+ populations and numbers represent percentage of BrdU+ cells (n = 5 mice per time point). To examine the extent of virus-specific T cell migration to the CNS, we performed adoptive transfer experiments using Thy1.1/Thy1.2 mismatched cells. CD8 T cells were purified from the spleens of acutely (day 6 p.i.) and persistently (day 49 p.i.) infected Thy1.1 B6 mice and transferred into infection-matched wild-type congenic recipients. Only virus-specific CD8 T cells were analyzed in these studies because the frequency of M133-specific CD4 T cells in the spleen was extremely low at late times p.i. (e.g., Fig. 4⇑B). The frequency of S510 tetramer+ donor-derived cells was examined in the CNS, spleen and cervical lymph nodes of acutely and persistently infected recipients at 14 and 28 days after transfer, respectively. As expected, donor (Thy1.1) cells were readily detected in the CNS, spleen, and lymph nodes of infection-matched recipients at day 6 p.i., comprising 0.6–3.76% of epitope S510-specific cells in the CNS and 0.9–6% in the spleen (Fig. 7⇓A). The majority of donor-derived CD8 T cells in the brain were specific for epitope S510. Ag-experienced T cells migrate to the CNS during chronic infection. Spleen CD8+ T cells were enriched from acutely (A, day 6 p.i.) or chronically (B, day 49 p.i.) infected Thy1.1 mice and transferred into infection-matched Thy1.2 recipients. The frequency of S510 tetramer+ donor-derived cells were examined in the CNS, spleen, and CLN of recipients at 14 (A) or 28 (B) days after transfer. Cells were gated on CD8+ populations. Samples stained with LCMV H-2Db/GP33 tetramer served as controls. Numbers in the lower right quadrant of the left panels represent the percentage of Thy1.1 donor cells, and numbers in the upper quadrants of the right panels represent percentage of S510-specific Thy1.1− recipient or Thy1.1+ donor cells. Data shown are representative of six mice from two independent experiments. Similar results were obtained when splenic cells from persistently infected mice were transferred to infection-matched recipients. Approximately 0.15–2% of epitope S510-specific cells in the CNS and 2.7–10% in the spleen were Thy1.1+ (Fig. 7⇑B) and a large fraction of the transferred cells that trafficked to the chronically infected CNS were S510-specific. Collectively, these results suggest that within 28 days, 5.6–20% of the S510-specific T cells are replenished from peripheral memory CD8 T cell populations, if we assume that the 2.7–10% of S510-specific T cells in the spleen that were donor-derived were representative of the total S510-specific T cells in the spleen. Our results, suggesting that a large fraction of virus-specific memory T cells in the infected brain recently migrated from the periphery, raise the possibility that naive T cells could also be activated in the periphery and recruited to the CNS. 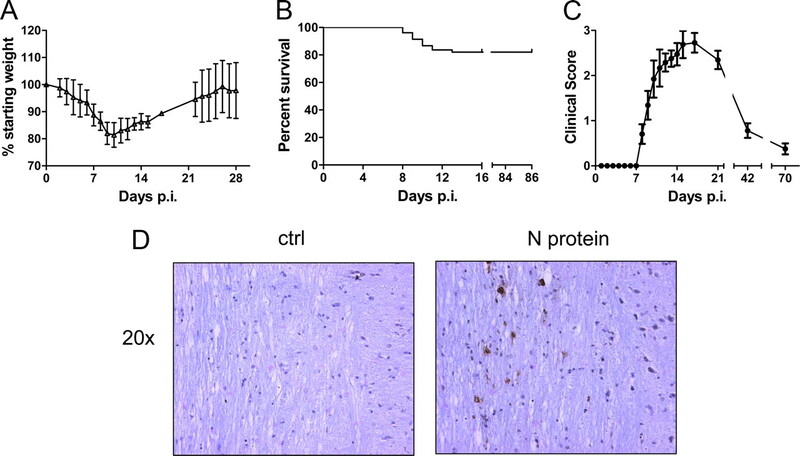 To assess recruitment of naive T cells to the persistently infected CNS, mice were treated with busulfan, a DNA-alkylating agent used to condition recipients for bone-marrow transplant, at 32 days p.i. One day after busulfan treatment, mice received bone marrow from naive, Thy1 congenic donors. Mice were then sacrificed at days 72–77 p.i. (40–45 days after transplant) and analyzed for the presence of donor-derived T cells. An advantage of busulfan treatment is maintenance of the memory T cell pool, thereby minimizing effects on overall T cell numbers and function, but still facilitating the analysis of newly recruited cells (10, 11). Of note, busulfan treatment resulted in no obvious clinical deterioration in rJ2.2-infected mice and mice continued to improve at the same rate as observed in untreated mice (data not shown). By 6–7 wk post busulfan treatment, 35–65% of CD4 and 25–45% of CD8 T cells in the blood, spleen, and CLN were donor-derived (Fig. 8⇓A). Only a small percentage of CD8 T cells in the infected CNS were of donor origin (∼0.5–2.5%), but 10–18% of these cells were epitope S510-specific, as measured by tetramer staining (Fig. 8⇓B). These cells represent less than 0.5% of all epitope S510-specific cells in the CNS, but the results clearly indicate that epitope S510-specific CD8 T cells were recruited from the naive T cell pool and were recruited to the CNS. The frequency of donor-derived CD4 and CD8 T cells in the CNS was similar. However, we were unable to identify any newly recruited donor-derived M133-specific CD4 T cells in the CNS, possibly because the absolute numbers of total and M133-specific CD4 T cells in the CNS at late times p.i. were very low (Fig. 2⇑, E and G). Virus-specific T cells in the CNS are also recruited from the naive T cell pool. Persistently infected B6/Thy1.2 mice (>32 days p.i.) were treated with busulfan. Twenty-four hours later, these mice were injected i.v. with 20 × 106 nucleated cells isolated from bone marrow of naive congenic Thy1.1 mice. Blood, spleen, CLNs, and CNS of chimeric mice were analyzed >40 days after bone marrow transplantation. A, Reconstitution of Thy1.1+ donor-derived CD4 and CD8 T cells in blood, spleen, and CLN of recipients. Numbers represent percentage of Thy1.1+ cells. 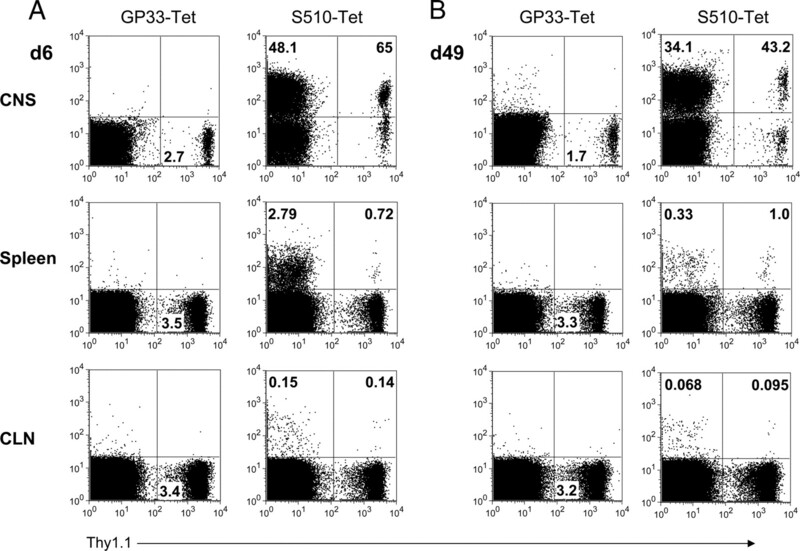 B, Donor-derived S510-specific CD8 and M133-specific CD4 T cells were determined by tetramer staining or intracellular IFN-γ staining, respectively. Cells were gated on CD8 (upper panel) or CD4 T cell populations (lower panel). Numbers in the lower right quadrant of the left panels represent the percentage of Thy1.1 donor cells, and numbers in the upper quadrants of the right panels represent percentage of Ag-specific Thy1.1− recipient or Thy1.1+ donor cells. Data shown are representative of nine mice from three independent experiments. Our results demonstrate that the persistence of virus-specific T cells in the CNS of mice chronically infected with rJ2.2 is partly dependent upon the continuous recruitment of cells from both the Ag-experienced and naive T cell pools (Fig. 7⇑ and 8⇑). We detected low levels of T cell proliferation in the persistently infected CNS (Fig. 6⇑). Although cell proliferation was generally believed to occur only in lymphoid tissue, with retention as nondividing cells in nonlymphoid tissue (26), more recent data support that T cell proliferation can occur in peripheral tissue (27). Thus, these results may represent cell division at the site of infection or recruitment from secondary lymphoid organs. Some of these proliferating cells may have entered the CNS during early stages of the infection. However, a substantial fraction of the cells are recent immigrants, originating largely from virus-specific effector and/or memory T cell populations. A small fraction of these virus-specific T cells are derived from the naive T cell pool. Recent work has shown that virus-specific T cells recruited from the naive T cells are important in maintaining numbers of virus-specific T cells in mice persistently infected with polyomavirus or LCMV. These newly recruited cells are CD27high and CD62Lhigh, thereby differing from pre-existing memory cells. These cells are not detected in thymectomized mice and are required to maintain virus-specific T cell levels (10). In another chronic infection, mice infected with murine cytomegalovirus, virus-specific T cell numbers are also maintained in part by recruitment from the naive T cell pool. However, murine cytomegalovirus-specific T cell numbers are also replenished by recruitment of short-lived effector-like cells derived from T cell populations that were primed at early times p.i. Additional work will be required to determine whether rJ2.2-specific memory T cells required for maintenance of cell numbers in the CNS are primed during the acute infection or are largely derived from the naive T cell populations during persistent virus infection. The requirement for Ag persistence in maintenance of T cells in the CNS remains controversial. Klonowski et al. (28) investigated the trafficking of memory CD8 T cell populations to various peripheral tissues using parabiotic mice, and concluded that memory cells could be established in lymphoid and nonlymphoid tissues by a process of recruitment that was independent of inflammation and Ag. However, T cell recruitment to the brain was restricted. Consistent with these results, virus-specific CD8 T cells could not be detected in the brains of mice infected with the attenuated J2.2/7.2-V-2, a virus that appears unable to establish persistence as measured by RT-PCR (4, 29). In contrast, influenza virus-specific CD8 T cells appear to be maintained in the CNS for at least 10 mo after resolution of an acute infection, in the absence of detectable infectious virus or viral protein. Of note, however, viral RNA could be detected using RT-PCR, raising the possibility that low levels of viral Ag were also present (30). One question that arises is how naive virus-specific T cells are primed because virus Ag-expressing cells were not surrounded by areas of obvious inflammation. One possible explanation is that these cells either undergo natural turnover or are eventually recognized and killed by virus-specific CD8 T cells, before engulfment by phagocytic cells. The latter then migrate to draining lymph nodes where an antiviral immune response is initiated or propagated. Newly activated cells, whether from memory or naive T cell pools, would then migrate to the CNS, replenishing the pool of antivirus T cells. Of note, the lower levels of virus Ag present in the persistently compared with the acutely infected CNS may contribute to the changes in immunodominance of the M133 and S358-specific CD4 T cell responses that we observed (Fig. 3⇑). Changes in relative immunodominance of CD8 T cell responses were also observed in J2.2-V-1-infected B6 × BALB/c F1 mice. In these animals, a CD8 T cell response to an epitope in the nucleocapsid protein (N318) predominated at early times whereas S510-specific CD8 T cells were more prevalent at late times p.i. (25). In rats infected with JHMV, levels of S protein in the brain diminish more rapidly than those of other viral proteins during the course of persistence (31). Whether changes in relative abundance of the S and M proteins occur during rJ2.2 persistence in mice and whether such changes contribute to preferential maintenance of the epitope S358-specific CD4 T cell response requires additional investigation. Our results also show that virus-specific CD8 and CD4 T cells in the chronically infected CNS are largely functional. A previous report showed that CD8 T cells in the CNS of mice persistently infected with J2.2-V-1 were functionally impaired, as shown by reduced cytotoxic function when examined directly ex vivo (25). In this study, we show that these Ag-specific CD8 T cells degranulated normally in response to target cells in vitro, but with diminished production of granzyme B as compared with acute phase effector CD8 T cells. This is characteristic of memory CD8 T cells and leads to decreased cytotoxicity. However, memory cells up-regulate expression of granzyme B after activation and expansion in culture (32, 33) and resting memory CD8 T cells that are poorly cytolytic as measured by in vitro 51Cr release assays eliminate target cells rapidly in vivo in LCMV-infected mice (34). Therefore, we argue that the antivirus CD8 T cell function is not significantly impaired in rJ2.2-infected mice. In summary, T cell maintenance at a site of chronic localized infection requires replenishment from peripheral Ag-experienced and naive T cell pools. The recruitment of naive T cells also suggests that cell numbers are maintained by at least some of the same mechanisms previously identified in persistent systemic infections. Future work will be directed at determining the signals critical for influx of these cells into the persistently infected CNS at times when inflammation is diminished. We thank Dr. Steven Varga and Kathryn Trandem for critical review of the manuscript and the NIH Tetramer Facility for providing MHC class I and II tetramers. ↵1 This work was supported in part by Grants from the National Institutes of Health (NS36592) and National Multiple Sclerosis Society (RG 2864). ↵3 Abbreviations used in this paper: p.i., post infection; LCMV, lymphocytic choriomeningitis virus; CLN, cervical lymph node. Fleming, J. O., M. D. Trousdale, F. A. el-Zaatari, S. A. Stohlman, L. P. Weiner. 1986. Pathogenicity of antigenic variants of murine coronavirus JHM selected with monoclonal antibodies. J. Virol. 58: 869-875. Fleming, J. O., C. Adami, J. Pooley, J. Glomb, E. Stecker, F. Fazal, S. C. Baker. 1995. Mutations associated with viral sequences isolated from mice persistently infected with MHV-JHM. Adv. Exp. Med. Biol. 380: 591-595. Zuo, J., S. A. Stohlman, G. I. Parra, C. C. Bergmann. 2009. IL-15 independent maintenance of virus-specific CD8+ T cells in the CNS during chronic infection. J. Neuroimmunol. 207: 32-38. Marten, N. W., S. A. Stohlman, C. C. Bergmann. 2000. Role of viral persistence in retaining CD8+ T cells within the central nervous system. J. Virol. 74: 7903-7910. Anghelina, D., L. Pewe, S. Perlman. 2006. Pathogenic role for virus-specific CD4 T cells in mice with coronavirus-induced acute encephalitis. Am. J. Pathol. 169: 209-222. Stohlman, S. A., D. R. Hinton, B. Parra, R. Atkinson, C. C. Bergmann. 2008. CD4 T cells contribute to virus control and pathology following central nervous system infection with neurotropic mouse hepatitis virus. J. Virol. 82: 2130-2139. Shin, H., S. D. Blackburn, J. N. Blattman, E. J. Wherry. 2007. Viral antigen and extensive division maintain virus-specific CD8 T cells during chronic infection. J. Exp. Med. 204: 941-949. Vezys, V., D. Masopust, C. C. Kemball, D. L. Barber, L. A. O'Mara, C. P. Larsen, T. C. Pearson, R. Ahmed, A. E. Lukacher. 2006. Continuous recruitment of naive T cells contributes to heterogeneity of antiviral CD8 T cells during persistent infection. J. Exp. Med. 203: 2263-2269. Kemball, C. C., E. D. Lee, V. Vezys, T. C. Pearson, C. P. Larsen, A. E. Lukacher. 2005. Late priming and variability of epitope-specific CD8+ T cell responses during a persistent virus infection. J. Immunol. 174: 7950-7960. Kim, T. S., S. Perlman. 2005. Viral expression of CCL2 is sufficient to induce demyelination in RAG1−/− mice infected with a neurotropic coronavirus. J. Virol. 79: 7113-7120. Pewe, L., H. Zhou, J. Netland, C. Tangudu, H. Olivares, L. Shi, D. Look, T. Gallagher, S. Perlman. 2005. A severe acute respiratory syndrome-associated coronavirus-specific protein enhances virulence of an attenuated murine coronavirus. J. Virol. 79: 11335-11342. Williams, R. K., G. S. Jiang, S. W. Snyder, M. F. Frana, K. V. Holmes. 1990. Purification of the 110-kilodalton glycoprotein receptor for mouse hepatitis virus (MHV)-A59 from mouse liver and identification of a nonfunctional, homologous protein in MHV-resistant SJL/J mice. J. Virol. 64: 3817-3823. Miura, T. A., E. A. Travanty, L. Oko, H. Bielefeldt-Ohmann, S. R. Weiss, N. Beauchemin, K. V. Holmes. 2008. The spike glycoprotein of murine coronavirus MHV-JHM mediates receptor-independent infection and spread in the central nervous systems of Ceacam1a−/− mice. J. Virol. 82: 755-763. Perlman, S., R. Schelper, E. Bolger, D. Ries. 1987. Late onset, symptomatic, demyelinating encephalomyelitis in mice infected with MHV-JHM in the presence of maternal antibody. Microb. Pathog. 2: 185-194. Pewe, L., S. B. Heard, C. Bergmann, M. O. Dailey, S. Perlman. 1999. Selection of CTL escape mutants in mice infected with a neurotropic coronavirus: quantitative estimate of TCR diversity in the infected central nervous system. J. Immunol. 163: 6106-6113. Xue, S., S. Perlman. 1997. Antigen specificity of CD4 T cell response in the central nervous system of mice infected with mouse hepatitis virus. Virology 238: 68-78. Haring, J. S., L. L. Pewe, S. Perlman. 2001. High-magnitude, virus-specific CD4 T-cell response in the central nervous system of coronavirus-infected mice. J. Virol. 75: 3043-3047. Castro, R. F., S. Perlman. 1995. CD8+ T-cell epitopes within the surface glycoprotein of a neurotropic coronavirus and correlation with pathogenicity. J. Virol. 69: 8127-8131. Adams, A. B., M. M. Durham, L. Kean, N. Shirasugi, J. Ha, M. A. Williams, P. A. Rees, M. C. Cheung, S. Mittelstaedt, A. W. Bingaman, et al 2001. Costimulation blockade, busulfan, and bone marrow promote titratable macrochimerism, induce transplantation tolerance, and correct genetic hemoglobinopathies with minimal myelosuppression. J. Immunol. 167: 1103-1111. Lin, M. T., D. R. Hinton, N. W. Marten, C. C. Bergmann, S. A. Stohlman. 1999. Antibody prevents virus reactivation within the central nervous system. J. Immunol. 162: 7358-7368. Parra, B., D. R. Hinton, N. W. Marten, C. C. Bergmann, M. T. Lin, C. S. Yang, S. A. Stohlman. 1999. IFN-γ is required for viral clearance from central nervous system oligodendroglia. J. Immunol. 162: 1641-1647. Bergmann, C. C., J. D. Altman, D. Hinton, S. A. Stohlman. 1999. Inverted immunodominance and impaired cytolytic function of CD8+ T cells during viral persistence in the central nervous system. J. Immunol. 163: 3379-3387. McGill, J., N. Van Rooijen, K. L. Legge. 2008. Protective influenza-specific CD8 T cell responses require interactions with dendritic cells in the lungs. J. Exp. Med. 205: 1635-1646. Klonowski, K. D., K. J. Williams, A. L. Marzo, D. A. Blair, E. G. Lingenheld, L. Lefrancois. 2004. Dynamics of blood-borne CD8 memory T cell migration in vivo. Immunity 20: 551-562. Fleming, J. O., M. D. Trousdale, J. Bradbury, S. A. Stohlman, L. P. Weiner. 1987. Experimental demyelination induced by coronavirus JHM (MHV-4): molecular identification of a viral determinant of paralytic disease. Microb. Pathog. 3: 9-20. Hawke, S., P. G. Stevenson, S. Freeman, C. R. Bangham. 1998. Long-term persistence of activated cytotoxic T lymphocytes after viral infection of the central nervous system. J. Exp. Med. 187: 1575-1582. Parham, D., A. Tereba, P. J. Talbot, D. P. Jackson, V. L. Morris. 1986. Analysis of JHM central nervous system infections in rats. Arch. Neurol. 43: 702-708. Curtsinger, J. M., D. C. Lins, C. M. Johnson, M. F. Mescher. 2005. Signal 3 tolerant CD8 T cells degranulate in response to antigen but lack granzyme B to mediate cytolysis. J. Immunol. 175: 4392-4399. Nowacki, T. M., S. Kuerten, W. Zhang, C. L. Shive, C. R. Kreher, B. O. Boehm, P. V. Lehmann, M. Tary-Lehmann. 2007. Granzyme B production distinguishes recently activated CD8+ memory cells from resting memory cells. Cell Immunol. 247: 36-48. Barber, D. L., E. J. Wherry, R. Ahmed. 2003. Cutting edge: rapid in vivo killing by memory CD8 T cells. J. Immunol. 171: 27-31.